ON1 Photo RAW 2017 is an all-in-one photo browsing, editing and effects tool which can work as a standalone program or as a plug-in for Lightroom or Photoshop. 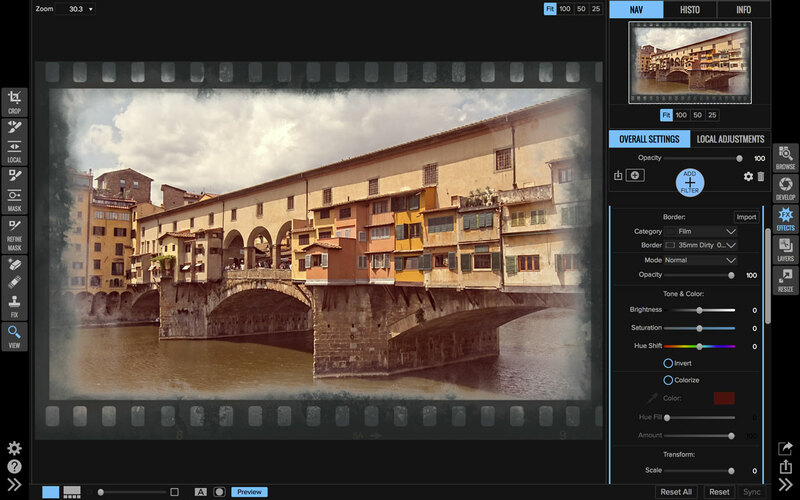 It’s a replacement for ON1 Photo 10.5, and it’s the latest version of a long-running photo effects suite previously consisting of a whole bundle of effects modules but recently integrated into a single app. The latest additions include a new Fast Preview mode that uses embedded previews when you browse a folder full of images so that you can carry out an initial cull much more quickly and render full previews later, and Indexed folders have now become Catalogued folders, which are checked and scanned and refreshed automatically. The white balance slider for RAW files now shows Kelvin values rather than a relative scale and it’s now possible to rotate vertical images anywhere, not just in grid view. ON1 Photo RAW 2017.6 brings some performance and tool improvements as well as support for new cameras. The idea with ON1 Photo RAW 20.17 is that you can use this one program to browse and organise your photos, develop and enhance both RAW and JPEG files, use ON1’s large library of special effects and customisation tools and even combine images in layers, Photoshop-style. It covers a whole spectrum of uses that might otherwise need two or three different applications. 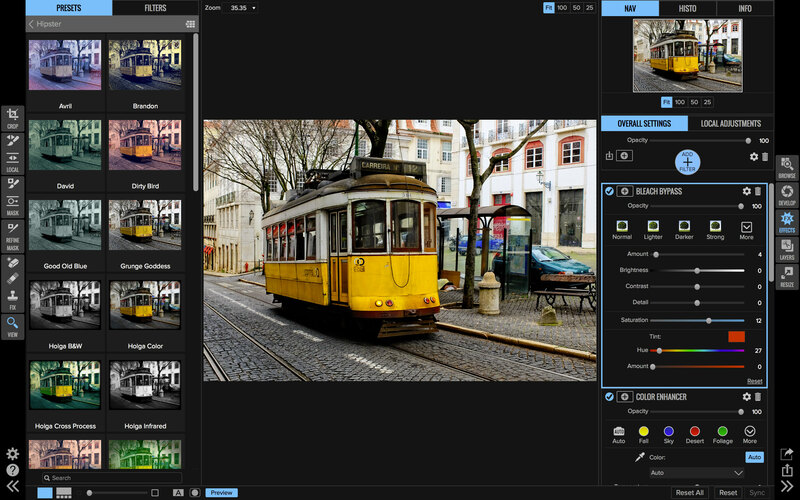 If you use Lightroom, for example, you might need Photoshop for layering and compositing and something like the Google Nik Collection for image effects. ON1 Photo RAW 2017 aims to do all three. This is where you do your image organising, and ON1 sets great value by this module’s speed and efficiency. 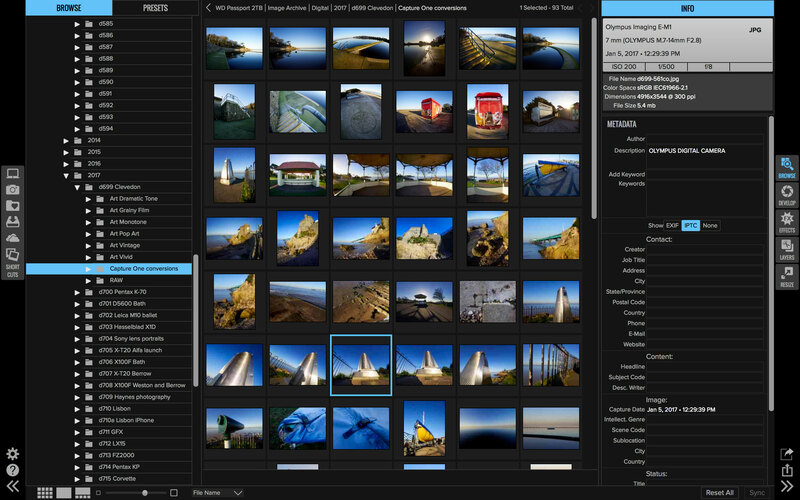 You don’t have to import your images into a catalog in the way you do with Lightroom, for example, and the Browse module can quickly display the contents of the image folders on your computer ready for adding ratings, keywords, labels and other metadata. 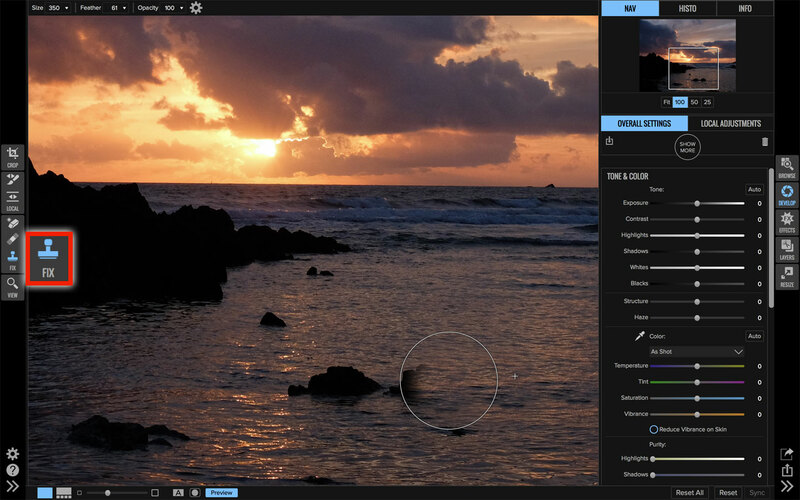 There are filtering tools too, so that you can quickly isolate the photos you’re looking for. The Browse module works as a fast and simple file browser, but with the ability to view and add metadata and apply filters for finding specific images quickly. But the Browse module also offers some of the advantages of a regular catalog system. You can create Albums, for example, or Smart Albums based on specific search criteria. This is where things get slightly more complicated, however. Albums are easy enough to create, but they’re displayed as a flat list without any folder system for establishing a hierarchy. The more albums you add, the more tedious scrolling you’re going to have to do. Smart Albums need an extra step because they can only be used for images that have been ‘Catalogued’ (previously this was called ‘Indexing’). This is not automatic. If you want to catalog a folder you have to drag it into a Catalogued Folders pane at the top of the Browse panel. Any pictures in folders which haven’t been catalogued won’t show up in Smart Albums. It is possible to see images stored in sub-folders within a larger folder, which saves lots of drilling down through a folder hierarchy, but again only if that folder has been catalogued. Wouldn’t it be better to have ON1 Photo RAW 2017 using its regular fast folder browsing tools but automatically cataloguing folders in the background too? 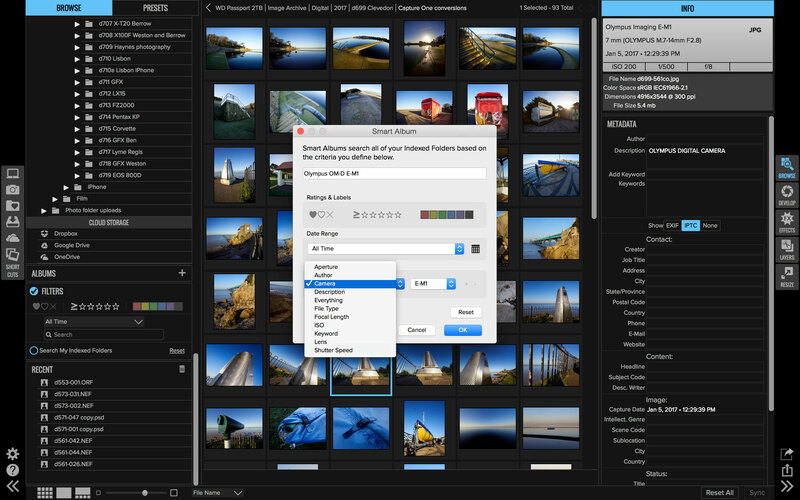 In any event, cataloguing is an important and useful step because ON1 Photo RAW 2017.6 has new and improved filtering and search tools. These can search not just the current folder, Album or view but, if you click the ‘Search Catalogued Folders’ button, all your indexed folders too. The search tools have been improved too so that it’s now possible to search for multiple criteria using and/or operators. For example, you could look for all photos shot with a specific camera body AND and specific lens AND with a specific star rating. Or, you could search for all photos taken with one particular camera OR with another. I like the flexibility and power of a database-driven cataloguing program like Lightroom, but plenty of other photographers get by perfectly well with a simple folder-browsing solution. ON1 Photo RAW tries to have its cake and eat it with a simple folder browsing setup but with the Cataloguing feature for Smart Albums and archive-wide searches. It kind of works, but it depends a lot on how well organised you are with your indexing and how far ON1 Photo has got with what can be a pretty lengthy process – it takes a long time to index tens of thousands of photos, though there is now a circular progress bar for each folder you’re cataloguing to show you how far it’s got, and once you’ve catalogued your folders – hopefully a one-off task – folder scanning and updating in the future will happen in the background and should be a smaller, quicker task. When you want to take a closer look at individual images, you can double-click a thumbnail to view a full-size preview and click again to view it at 100% magnification. The Browse module can also access images stored via cloud services including Dropbox, Google Drive and OneDrive – a nice touch – and there’s a ‘Photo Via’ feature for publishing Album contents on your mobile devices via Dropbox or Google Drive. There’s now a Compare mode which lets you compare a whole bunch of similar photos at the same time. This is really useful if you’ve been a bit trigger-happy and you’ve taken a lot of shots to be sure of getting a good one. You can zoom in to the same magnification on all of them, adjust the framing individually to make sure the same object is centred, then pan and zoom them all simultaneously. You can exclude images you don’t want and select individual images from the remainder to apply star ratings for example. It’s a useful feature that works well. The new ON1 Photo RAW 2017 Compare mode is great for sorting through continuous shooting sequences to find the sharpest/best image. Of course, you don’t have to use the ON1 Browse module at all. ON1 Photo RAW 2017 also works as a Lightroom plug-in, so here you still get the benefit of ON1’s effects and layering tools, but the sophistication of Lightroom’s organisation and its powerful RAW processing features. If you don’t use a program like Lightroom, you can carry out your RAW processing in ON1 Photo RAW 2017’s Develop module instead. ON1 Photo 10.5 had a relatively basic Enhance module, but that’s gone. 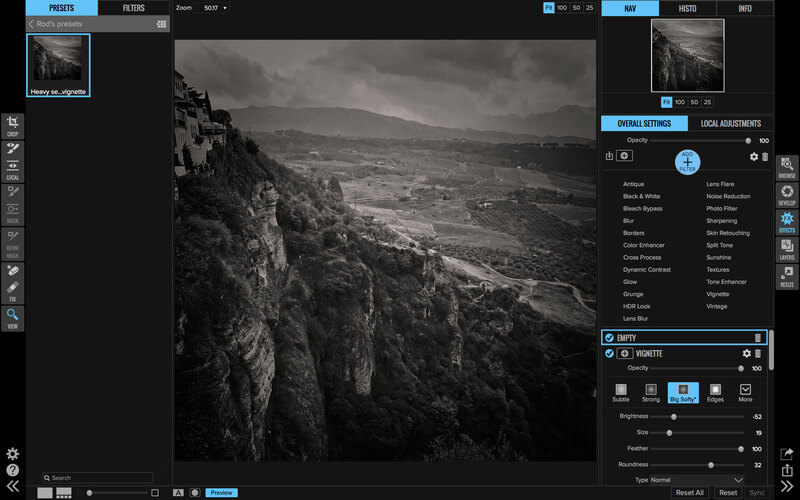 In its place is a Develop module which can carry out a whole range of image enhancements, including Black & White, Color Adjustment, Curves, Glow, Noise Reduction, Sharpening, Skin Retouching, Split Tone, Transform and Vignette. This Develop module can be used on both JPEG images and RAW files. It doesn’t have quite the same power, control and fluidity as Lightroom with RAW files, but it does a pretty good job. The previous version didn’t do so well with the RAF files from a Fujfilm X30 compact, failing to pull back all of the extended highlight information the camera’s expanded dynamic range mode can capture, and neither did it apply the distortion correction baked into the camera’s RAW files. Version 2017.5, however, brought improvements here and support for new cameras. My Fujifilm X30 images are now distortion-free, and RAW files from another camera that gave the previous version problems – the newly-launched Canon EOS 800D – now open without cryptic messages about colour scaling and interpolation. Version 2017.6 brings support for the Canon EOS 6D Mark II, Olympus TG-5, Nikon D7500, Leica TL2 and Canon Rebel SL2/EOS 200D. ON1 Photo RAW 2017 also brings improvements to the Develop module. The previous version lacked the automatic lens correction profiles commonly found in other RAW converters, but they’re here now. The software identified the Canon EF-S 18-55mm kit lens used for some of my sample shots, identified and loaded the appropriate correction profile and did a great job of correcting distortion. It also identified the Sony 70-200mm f/2.8 G Master lens used for some more recent shots but didn’t have a matching profile – that’s perfectly understandable since it’s a brand new lens, and at least the lens correction mechanism is in place now. 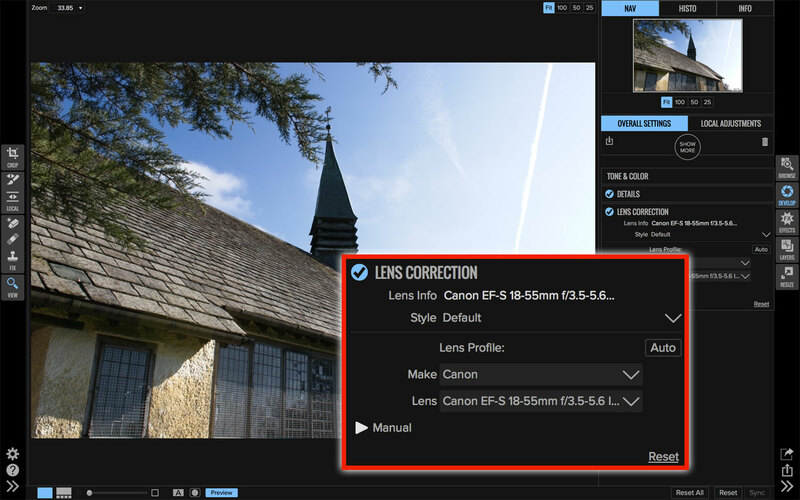 The Lens Correction panel in the Develop module can now locate and apply lens corrections automatically. With RAW file it recognises, the Develop module works fine. It even lets you apply localised adjustments – here I’ve darkened the bright sky with a gradient mask and exposure adjustment. Like the Develop module in Lightroom, here you get both Overall and Local Adjustments. A small tools panel on the left side of the screen has Gradient and Adjustment Brush tools as well as a ‘Perfect Eraser’ and Retouch Brush. You can do quite a lot in the Develop module – in fact, this may be all you need for everyday image adjustments and enhancements. You can apply just one adjustment type or a whole series – the Develop module only shows the panels for those tools you’ve chosen, which keeps the screen clutter to a minimum. ON1 Photo RAW 2017 brings improvements here too. 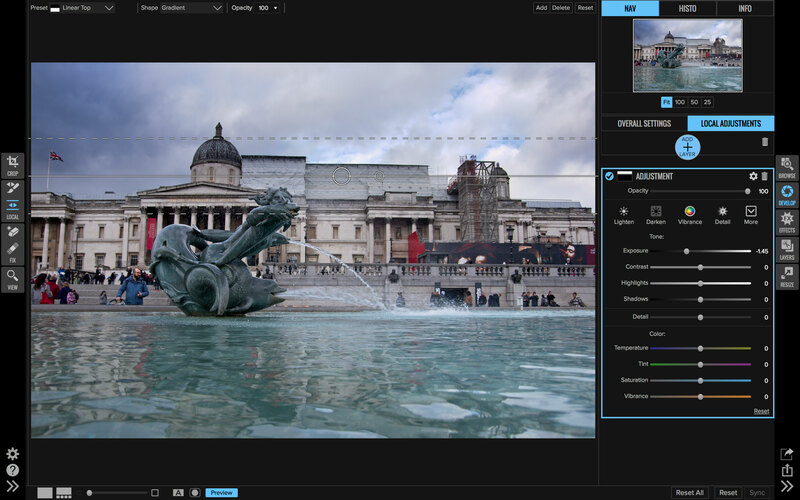 ON1 says its sharpening and noise reduction tools have been enhanced and these have now been brought together in a single Details pane in the Develop module so that they can be applied globally to RAW files. This makes sense, since sharpening and noise reduction often have to be traded off carefully at the same time, and a single Details panel is the approach taken by other applications, including Lightroom. The Develop module also gets the Clone Stamp tool previously found in the Layers module, so now you can clone out awkward objects as part of ON1 Photo RAW’s regular non-destructive workflow. It’s a modest change that actually makes quite a difference. Photo RAW also has a clever Perfect Eraser tool, but sometimes only the traditional Clone Stamp tool will give you the precision and control you need for making invisible repairs. The Develop module now has a Clone Stamp tool in the Fix section of the left toolbar. Over on the left side of the screen is a Presets panel, showing thumbnail versions of your selected photo with a whole range of different effects applied. In fact, these Presets are applied using the Effects module, not this one – if you choose one, you’ll need to swap to the Effects module to see what’s been done and make any changes. The Effects module is and always has been (in my opinion) the heart of the ON1 suite. It comes with a large library of effects presets in categories such as Architecture, Black & White, Cinematic, Hipster, Landscape and more. Each category contains a number of different presets, and each preset is built from a combination of different filters. There are over 20 of these filters, though typically each preset uses no more than a handful. They include Antique, Black & White, Bleach Bypass, Blur, Borders, Color Enhancer, Cross Process, Dynamic Contrast, Glow, Grunge, HDR Look, Lens Blur, Lens Flare, Noise reduction, Photo Filter, Sharpening, Skin Retouching, Split Tone, Sunshine, Textures, Tone Enhancer, Vignette and Vintage. There are three ways of using the Effects module. You can select a preset and stop there, you can choose a preset and then tweak the settings of the individual filters or you can start with a clean slate and add filters manually. Each filter comes with its set of controls which can be relatively simple (Antique, Bleach Bypass, Sharpening) or really quite sophisticated and powerful. 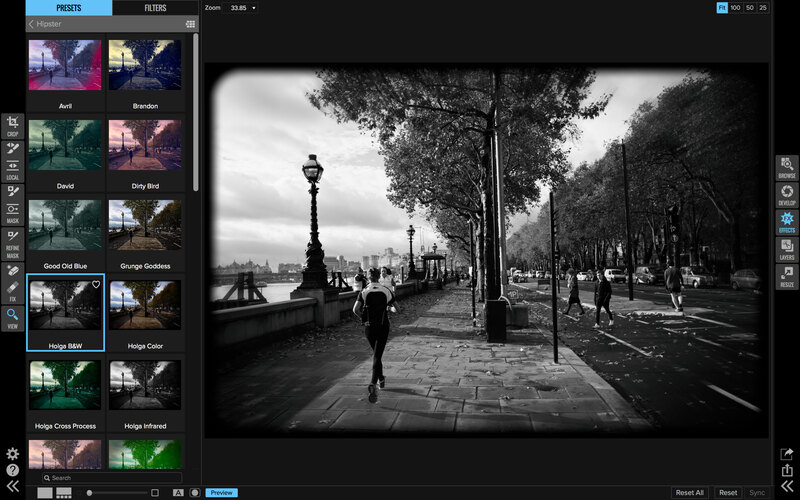 The Black & White filter, for example, offers different colour filter effects, tonal adjustments, toning effects and simulated grain. The Color Enhancer offers precise control over the rendition of different colours and ranges, quick fixes for skies, foliage, deserts and fall, and it’s also possible to neutralise (‘purify’) highlight and shadow tones. The Effects module is the real ‘heart’ of ON1 Photo RAW 2017, with an impressive array of preset effects, including this ‘Hipster’ category. You can create your own effects by combining up to 20 different effects filters in a ‘stack’ and then saving the result as a preset of your own. If you’re keen on analog/retro looks, you’ll love the huge library of textures and borders and you can even add in some fake lens flare. The strength of this module is the way you can stack any number of these effects to create the look you want. You can use masking tools (brush and ‘gradient bug’) to localise any of the filter effects, and all of them remain editable and even change the blending mode for that filter. In past versions, editing any filter would temporarily hide the effect of others higher up the stack, which made your adjustments hard to judge, but this limitation has been removed in ON1 Photo RAW 2017. If you’re looking for parallels, this filter stacking system is a lot like the one in Color Efex Pro, part of the Google Nik Collection, and perhaps MacPhun Luminar’s interesting new approach to editing workspaces. There’s a lot to like in this Effects module. You won’t find every preset and every filter useful, of course, since we all shoot differently, but there are a lot of great ‘looks’ here, and the potential to create and save many more presets of your own – that too is easy. On top of all that, all the adjustments you make in both the Effects module and the Develop module are non-destructive. You can go back at any time and make changes, and adjustments only become final when you export a finished image – which you’ll need to do for your changes to be made permanent and visible to other applications. One relatively minor criticism is that you can’t make ‘virtual copies’ to try out different variations on a single image, though ON1 has said that this feature is on its way, which is great news. You can’t group or stack related images in the Browser module, either, though, so it’s a reminder that while ON1 Photo RAW 2017 is a powerful effects tool, it’s still got some catching up to do in other areas. In ON1 Photo RAW 2017.5, however, ON1 added a very useful new feature. Previously, when you chose a preset it wiped out all the filters and adjustments you already had. Now, it’s possible to ‘stack’ presets on top of any presets you’ve already applied. 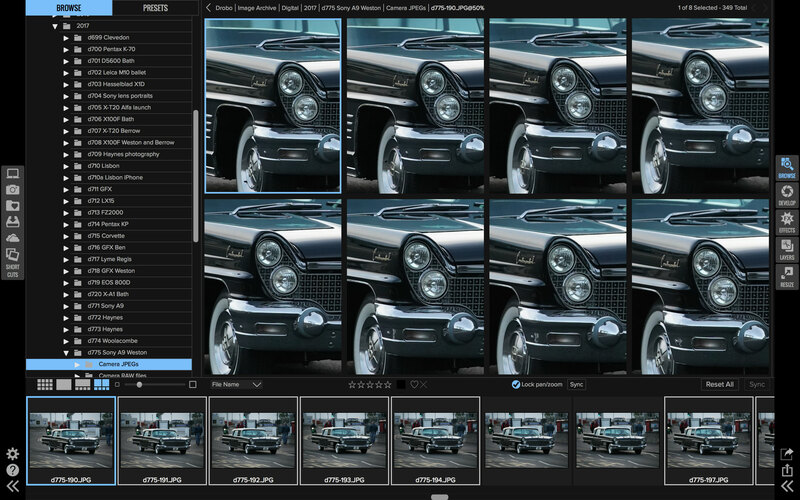 You simply select the top filter in the current stack, then hold down the Alt key as you browse through the effects presets – the thumbnails now change to show how the image will look with the new preset added on top of the existing filters. That’s a really smart and useful addition. It’s now possible to ‘stack’ effects on top of each other and preview the cumulative effect in the presets panel. ON1 Photo RAW isn’t just an enhancement tool and effects browser, because it also offers a full layers system, so you can create layered montages using the landscape from one shot, for example, with the sky from another. It does this using the Layers module, and if you’re used to the layers panel in Photoshop or Elements, you’re not going to find this so very different. You can choose the layers you want to merge from the Browse module by command/Ctrl-clicking each one. When you switch to the Layers module, these are stacked together in the Layers panel. You can do pretty much everything here that you can do in Photoshop. You can change the blend mode, change the order of the layers and create layer masks. It’s not quite Photoshop, but ON1 Photo RAW 2017 does let you combine different images using blend modes, masks and retouching tools. The masking tools are very good. There’s a handy ‘Masking Bug’ for creating and adjusting linear gradient masks – perfect for blending in skies or adding a graduated filter effect – Masking Brush, Quick Mask and polygonal selection tools. You can also refine masks once they’re created with a Refine Brush, Chisel Mask and Blur Mask tools. If a layer is the wrong size or in the wrong place, you can move and resize it easily with the Move tool. These tools are in a vertical panel on the left of the screen, along with a Crop tool, Perfect Eraser, Red Eye Brush and Retouch Brush. It’s a pretty self-contained module, but if you do need to make tonal or colour adjustments in a layer you’ll need to select it and switch back to the Develop module to make your changes. Preset effects, however, can be applied to the whole composite image, which is a bonus. The need to switch modules for some editing tasks means that ON1 Photo RAW’s Layers module isn’t really quite the same as being in Photoshop, but it still allows you to combine effects, enhancements and image layers in a single program. Resize module but no Portrait module? The Resize module is designed to optimise photos for printing. It uses Genuine Fractals technology to produce better-quality resizing than you could get from regular resampling processes, which inevitably blur edges where extra pixels have to be interpolated or removed. Instead, the Resize technology analyses the image for object edges and preserves the sharpness of these edges during the enlargement process. What previous users may have noticed in ON1 Photo RAW 2017, however, is that the Portrait module is gone. I remarked in my review of ON1 Photo 10.5 that it seemed odd to give this relatively specialised module equal status in the interface to the entire Effects library, and ON1 must have felt the same way because it has said on its website that the portrait tools are going to be re-introduced as part of the Effects module. ON1 has come a long way with Photo RAW 2017.6. Its Develop module is vastly improved and now has automatic lens corrections, a combined Detail panel for noise reduction and sharpening and a non-destructive Clone Stamp tool. Once you get to grips with the way it works, it’s really quite logical – and it’s certainly very powerful. The Effects module continues to be the most impressive part of this program, and you can create some great image effects with comparatively little time, effort and experience. The Develop module is now starting to approach the power, control and quality of dedicated RAW processors like Lightroom, Capture One Pro or DxO Optics Pro. You probably wouldn’t use it as a front-line RAW converter for exacting professional work, but judged simply as one of the tools built into an all-in-one image-editing application, it now looks pretty good. You can perhaps say the same about the Layers module. It does what Photoshop and Affinity Photo can do, kind of, but in a somewhat clunkier and more limited way. In short, this is a great do-it-all program that combines a whole bunch of functions that otherwise would need separate apps. It offers all these tools in one place, at a single, affordable price. This is what you’re paying for, however, rather than mastery in any single area. The Effects are terrific and always have been, and this latest 2017.6 release continues to chip away at a few of the shortcomings in previous versions. I am an amateur photographer who has been recently trying out some of the newer image processing software …. ON1 RAW, Luminar, Picktorial, Affinity Photo, and so on. I am trying to escape the force field of Adobe or to subscribe to this blog’s original charter “Life after Photoshop”. I was an original Aperture user who switched to LR, then to Capture One, then back to LR. Throughout this process I had been a Perfect Suite/ON1 user. I therefore, appreciate your reviews of the newer software including this current review of ON1 RAW 2017. ON1 really had very disastrous release in December. The products was terrible and left many feeling mislead and badly treated. Since then, they have come out with several updates that have solved many, but not all, of their problems. Some of the shortcomings in your review are scheduled for updates in late May or Early June….. Lens corrections, CA reduction, preset stacking, etc. On Friday in their company blog admitted to some of their problems and short comings. It was a fall on your sword moment, except they really did not want to injure themselves too badly …. flesh wounds only! So your review is spot on in general and my experience is similar. However (did you think I would write all this just to praise you) I have a slightly different outlook on your conclusions. This may never be a high end, professional used software, but for most enthusiast photographers who are looking for a non subscription software to enhance their images, this may just be the right software. I also think that the software is probably more “sophisticated” than it first appears. I have found working with blending modes, local adjustments, and that magic gear in the upper right, I can do more than I originally thought. I would give ON1 an 87% verdict. I hope they continue to improve this product. Hope to see you eventually do an extensive comparison of all the newer software later this year. Dear Rod many thanks for yet another very good review and today you do DxO Optic Pro 11 too – I really like and enjoy your postings very much! Further to John whose comments are very fair – ON1 are still a shambles even if one credits them with being well minded incompetents. They cannot even communicate efficiently with their own users – last week they posted a private “hidden” upgrade – then they released it more publicly – but it would not automatically update or even appear if you tried “Check for updates”. At many points during the last 9-10 months they have promised so much but failed to deliver. Their much hyped December release was a real travesty – didn’t even have a histogram in a RAW editing software! The failures are documented on their site and elsewhere so I will not burden any readers with more repetition here. However, I do feel it is fair to comment that although last Friday ON1 admitted that “….. it had taken longer than anticipated ….” they have since June/July last year continuously over-hyped their product as the “fastest, completely new RAW editor etc etc” and have posted misleadingly fast video tutorials compared with the software’s actual performance with normal sized camera files – they have used smoke and mirrors – AND THEY HAVE NEVER ACTUALLY SAID SORRY ! By all means try the free trial but as a very frustrated long time user of ON1 my recommendation would be not to pay for the full package yet because it is still incomplete. It is a great pity because there are indications that ON1 Photo RAW could be a good package but it may be 2018 before it is weaned from premature release intensive care. I do agree with Rod and John that the Effects element is easy and often sufficient in itself to achieve some pleasant results. *PS I am something of a techno luster – so not an inexperienced user – currently using LR 6.9, PS CC 2017, DxO Optics Pro 11, DxO ViewPoint 3, ON1 Photo RAW 2017, Affinity, Photomatix 5 and beta 6, Luminance HDR, Dynamic Photo HDR 6, plus NIK, Topaz and more plugins than it would be possible to list! I’ve read a lot of negative reviews and comments but, I must say, I am one very satisified customer of the On1 Photo RAW 2017.5 software. I’ve worked with Photoshop for over a decade, used Lightroom and ditched it for Capture One Pro and was looking for an effects program to replace Siver Efex Pro when I came across On1. I downloaded the free Effects program from their site and immediately fell in love with the software. After a week of using the freebie, I purchased the full 2017.5 suite. On1 was not on my radar last December so I am oblivious to all the bad experiences some people have had. What I have personally experienced, however, is a company that has great tutorials and rapidly responds to emails. I’ve spent the last few days going through all the tutorial videos available on their YouTube channel and the comprehensive resources that come with the purchase of their software. Sure, there are things I don’t like, such as the indexing feature and the general sluggishness of the program but, with a little patience, I have been able to accomplish great things in a relatively short period of time. The presets and filters have sent me down creative roads I did not expect. I’m most excited about the software because, as young as it is as a full editing suite, it is already doing everything I want and need. It can only get better from here. I recommend you do not run the software on any computer that’s more than 2 years old. My laptop is pretty souped up and fairly new so I have very few issues with speed and efficiency. Photo RAW has crashed maybe 4 or 5 times since I’ve been using it so I get in the habit of saving my work often. Having said that, Photoshop has crashed (as has Capture One) a few times recently also. Despite a rough start with this particular software, the company seems to be improving its customer service and building on a photographic culture that makes me feel good to be part of it. Nice to hear some positive remarks. Thanks for commenting. I find this new version even more confusing with the interface still much too complex with tools scattered randomly and no clarity on how some things work – like “magic eye” tool which is almost impossible to understand. So far I find it very unimpressive. Having abandoned Photoshop and Lightroom CC two months ago for On1 RAW and Affinity Photo, I have resubscribed to Creative Cloud. On1 RAW is too slow and there’s too much lag on my 2015 MacBook Pro with 16GB RAM and an i7 3.1gHz processor (a system that is more than adequate). It crashes too often as well. The entire workflow feels very disjointed and the program is not as user-friendly as it could be. There are also too many features that I consider essential missing. Adobe’s products certainly have their flaws and I very much dislike the subscription model, but as someone who makes their living from photography, Lightroom and Photoshop are a hard combo to beat.